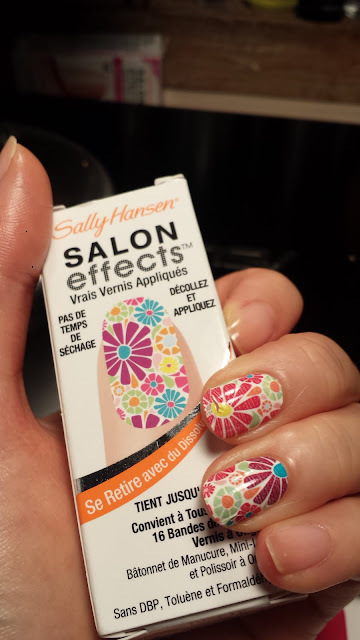 This was my first time trying these nail wraps by Sally Hansen and I want to do a quick first impression on them. The styleI had was a colorful floral pattern with a white base. 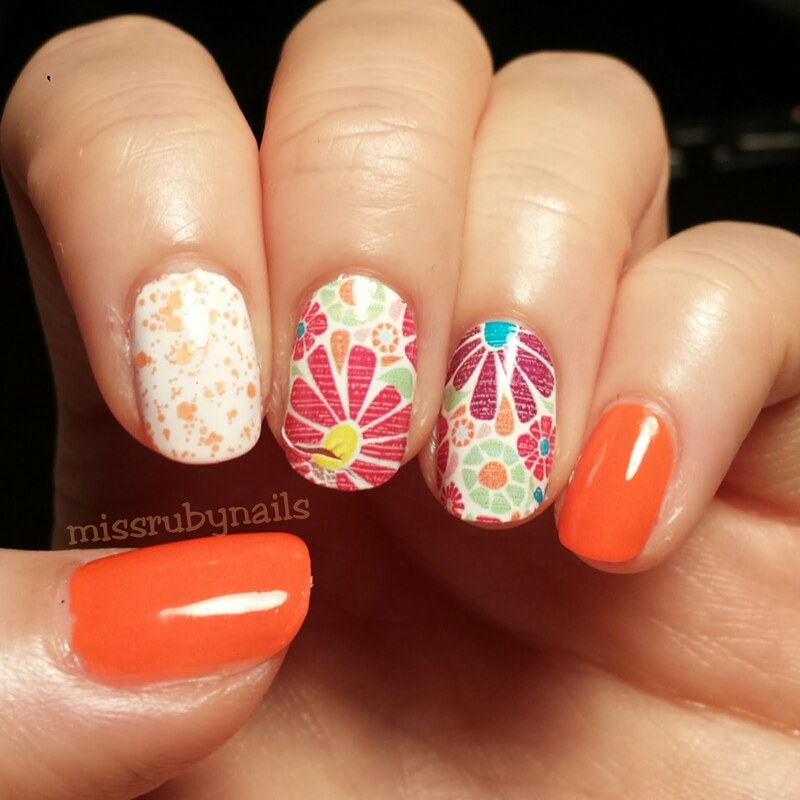 I thought this was very spring/summer and cheerful paired with bright colors. 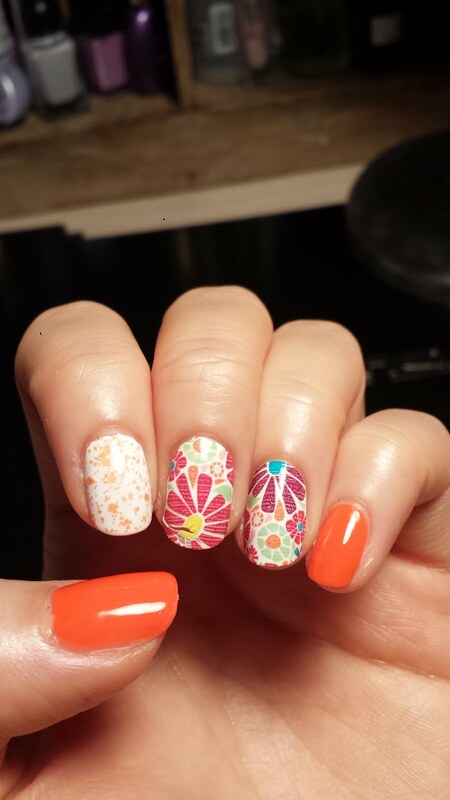 It a bit hard to control once you peeled it off and try to put it on your nail since they are very thin and delicate. The wrap could also tend to stick to itself if you are not careful with it. Once it stick together on itself, it is very hard to get them apart. I teared mine up as you can see on my middle finger. I find it helpful to warm the wrap up in between you palms before peeling them off the plastic. This way, the actual wrap would be a little more flexible to apply. Then you just have to press and push on the wrap and make sure there is no gap and the edges are all firming glued onto your nail. When filing the extras off at the tip, make sure you file gently in one direction and try to file downward so you are not lifting the tip of the wrap off. You could also apply a top coat over it if you like. But I find that just leaving the wrap without top coat can wear nicely too. The wear time of the wrap was comparable to my other nails with normal nail polish which was about 4 days before chipping. On my other nails I painted a combination of bright orange and white with orange chunky glitter to match the happy colorful theme going on here! This is adorable! I love your blog, and always look forward to your new ideas! I`ve already copied some of them at my favourite nails and spa salon here in Ibiza.